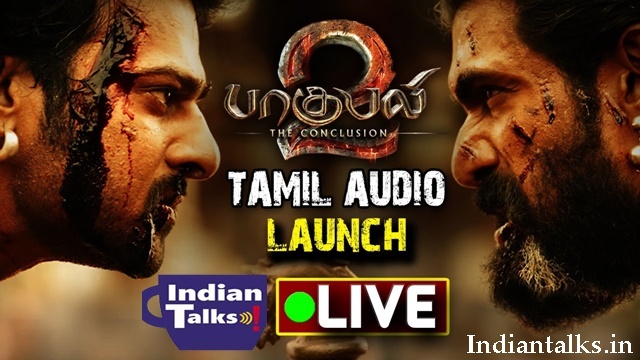 Watch Baahubali 2 Tamil Audio Launch LIVE: The Indian’s most anticipated films of this year Baahubali 2: The Conclusion. With just weeks left for the release of the film, the expectations it has among the audiences is very huge.Ahead of the release of Baahubali 2, the makers have organized a very grand Tamil audio launch function at YMCA ground in Chennai.which was hosted by popular RJ-turned-actor Balaji. According to reports, several eminent personalities of Kollywood Star are likely to grace the event. The makers also thanked the Tamil audience for their unconditional love and support.The Baahubali 2 Tamil Audio jukebox songs were also released on Sunday.The initial response to the music album has been encouraging. Baahubali 2 Movie Starring Prabhas, Rana Daggubati, Anushka Shetty, Tamannaah, Sathyaraj and Ramya Krishnan, Baahubali 2 will release in Telugu, Tamil, Malayalam, and Hindi simultaneously in India on over 6,500 screens on April 28.